Following the publication of his 7+8 topoguide in December, 2007, Bart van Raaij agreed to answer a few questions, a way to appreciate his work and get acquainted with the "bleausard". - Could you introduce yourself briefly and tell us what Bleau means to you ? Finding my way through the forest of Fontainebleau is more easy to me than navigating through Rotterdam, the city where I live and work. In Rotterdam I only know where to bring my two children (2 and 5) to school, where to bring my graphic designwork when it needs to be printed, how to find the climbing gym and where to go with my partner Irma Bergmans for the best coffee or lunch in town. In the Forêt Domaniale de Fontainebleau and surroundings I know almost every road, path and track that leads to a nice boulder. I did my first problems in Font in 1988 and at my third visit in 1992 I succeeded in climbing la Vie dAnge, my first seventh grade problem. I was so proud! 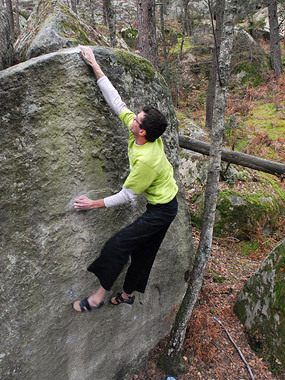 At that time I was a route climber and only in 1997 I started to really like bouldering. In 1998 I climbed the classic problem I had been dreaming about since my first visit: lAerodynamite. I found out that doing hard boulder problems suited me much more than hard sport climbs. More important, I had much more fun bouldering than climbing. 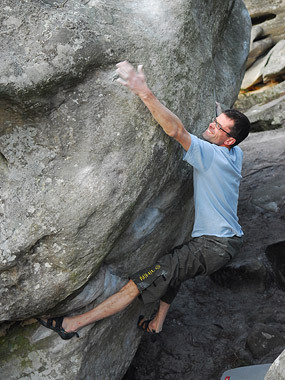 From that day to today I drove more than 125 times to Font and I have visited most major bouldering areas in the world. Although most of these areas are great I always love to return to the biggest and most versatile of all: Fontainebleau. In 2000 I completed all circuits in Bas Cuvier and the best red circuits in other areas. From then I started to concentrate on the harder problems. Most of the time I forget to do a proper warm up and after one or two easier problems I start climbing (or trying) seventh grade problems. I did my 100th seventh grade problem and my first 7c+ that year and what I really missed was a complete and accurate list with all seventh and eighth grade straight ups. The English Stephen Gough guidebook was out of date and completely messed up with my own additions and the purple guide by Jacky and Jo was a good follow up but still incomplete. I found Eric Lucas website 7ableau and I used his list as a basis to make my own list with all possible projects and future dreams. I bought all available guidebooks and worked on my own list until it was as complete and accurate as possible. Climbers started asking for my list because they wanted a copy too and thats how I got the idea of making a guidebook. Why not combine the things I love to do? Bouldering, graphic design, photography, drawing maps, having fun with my friends, making lists and publish my own book? In February 2001 I tested if it would be possible for me to draw all areas. I collected all the topos of Apremont (est) I owned and with Bernard Kroes and my list I went to the area to make my own drawing. My goal was to complete the topo of this complex area in one day. That day I had six different descriptions which all lead to Onde de Choc! But just before dark I had drawn all boulders and all problems. It convinced me that it would be possible timewise to make a guidebook of all the areas in Fontainebleau. All following trips to Font were spent on making my guidebook. The project lead me and my friends to all seventh and eighth grade problems I knew about. We discovered beautiful places we had never seen before and climbed most of the time for the book: problems that needed to be checked and problems I needed a picture of. When the work was finished Frank Bogerman offered to pay half of the printing costs and this made it possible to bring the book to the printer. The first edition proved to be a great success and I sold all books within three years. I received a large amount of very positive reactions, from all over the world. My personal project turned into an international success and we earned back all of the huge amount of money Frank and I invested. Its such a good feeling when people appreciate your work and as a graphic designer its great that users especially like the design and the quality of the topos and maps. I have personally never used my printed book. I kept working on my list, maps and topos and I am always in the forest with my own updated workbook. My guidebook was sold out in 2005 but people kept asking for a copy and shops did not stop sending me orders. This is why the decision to make a complete updated version was not hard at all. - Why this choice of 7 and harder grades ? Climbing 7a and harder is what I love to do. But also walking for hours to find a single great seventh grade problem doesnt feel like working to me. Sometimes I get up early in the morning and walk around in remote parts of the forest to find only one boulder with two problems. I know not many climbers will choose to climb these nearly unfindable problems. I have spent most of my time finding the most impopular ones. But I want my guidebook to be complete and I want to show the climbers there is more than Bas Cuvier. I can be very happy sitting beneath a boulder I finally found. I enjoy the silence, the view and my book being a little more complete and accurate. Sometimes I run back all the way to the area where my friends are climbing because I want to climb too. Now I have seen all problems in the higher grades I know which problems I really want to climb. I made my guidebook out of passion and not for commercial reasons. Thats why my book is only about what I want in a book; a complete list of hard problems and information on where to find them and how to do them. No touristic information, no traverses, no circuits. It would be impossible to make a complete and accurate guidebook with all problems of all grades. Maybe in future, when I am not able to climb 8a anymore, I will publish 6+7 or even 5+6. Right now the research for all the sixth grade problems does not interest me, though commercially it would be much more interesting! - Could you tell us about the improvements compared to 2002 edition ? The 2002 edition was very popular and I received not many complaints about the general look and set up. Thats why the 2008 edition is not much more than a complete updated version. I revisited all areas to make corrections in the topos and to add the new problems. Updating the maps was a lot of work too. Villages grew larger and road numbers have changed, roundabouts are added and GR signs disappeared. I added almost 30 areas and most of the photographs are new. There is less white space in the book and there are much more and larger photographs. What I am also proud of is the number of female climbers in the pictures. I did make some small changes and additions. There is information on the left side of the left pages to ease searching through the book and I changed the stars because people did not see the difference between the two types of stars I use. Completely new is the environmental information for specific areas and a list with 34 traverses. On the outside there are changes too. Another quality of paper allows pictures with more detail and this paper is more environmental friendly too. The plastic cover has a new look and I added a ribbon for practical reasons. I am a little disappointed about some of the pictures which turned out too dark. In my first topo some pictures turned out too light. - You mention your collaboration with bleau.info, can you expand on this a bit ? Without bleau.info I could not have made this book! Bleau.info once started with my original list a long time ago. Thats why I am listed as one of the editors. Now the website is updated every day with information from climbers all over the world. I use their opinions on the gradings when I am in doubt about upgrading or downgrading a problem. Most of the new information for my guidebook comes from this website because new problems and areas are announced here. Jean-Pierre Roudneff, who does a lot of work for the website, helps me out if I have a specific question about a problem. Its great that climbers can find so much information for free on bleau.info and whenever I have a correction or addition I contact Jean-Pierre Roudneff. But my book is not the printed version of the website. There are a lot of differences too! Off course I have also used other websites, the French climbing magazines and I spell every guidebook that appears! - You live in the Netherlands, wasnt this a problem ? I have to drive 500 kilometres to arrive in the forest. If we are lucky it takes us 4,5 hours. Most of the time we arrive Friday night. We climb Saturday and Sunday and start driving at 18:00 again. I drive the 1000 km once or twice a month. But I always drive there with my friends and we have a lot of fun or we dont say a word for hours. Counting the hours or litres of diesel I have spent on my guidebooks would drive me crazy so I have never done that. What I have done once is count how much money and how many hours I spent on my hardest boulder problem I have done but fortunately I forgot. Not being a Bleausard might be an advantage too. I dont think as a local; I write my book for climbers who dont know the forest. That might be the reason why I spend so much time on drawing clear maps and writing descriptions on how to find and climb a problem. Only the last years I met Bleausards like Jacky Godoffe, Jo Montchaussé, François Louvel and Jean-Pierre Roudneff and I am looking forward to meet Stéphan Denys. I have made my first book without any help of Bleausards. For my second book I received a little help and in the event of a third edition I would really appreciate their help. For example with a more professional traverse-list and more and better information on first ascentionists (name and year). - Your topo adopts a landscape presentation, any reason for this choice ? There are several reasons why I have made this decision. 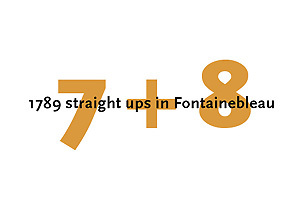 Most areas have a horizontal shape because most ridges with boulders in Fontainebleau have an east-west orientation. A landscape presentation allows me to present all my maps and topos on one page with the north at the top of the page. To my opinion this is the most obvious reason to make a landscape guidebook of Fontainebleau. Another reason is the opportunity you have to keep all information about one problem in one line of text, even in a relatively small book. If I had to put the same information in a portrait shaped book, the guidebook would have been much thicker (and thus more expensive) and less clear. When taking climbing pictures I prefer them portrait. A landscape book allows me to combine pictures, topos, maps and other pictures more easy in a landscape presentation. - Photography plays an important part, can you describe the choices you made, in particular the choice of black and white instead of colour ? 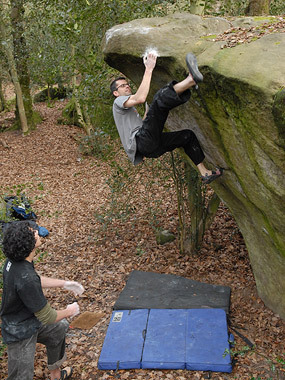 The photographs make my book more attractive and they show the reader what bouldering in Fontainebleau is about. But the pictures are not only decoration. Most of them help the reader with finding the problems that are not obvious to find. Thats why I really wanted a picture of, say, lIntrouvable or Hotline in my book. Without these pictures it is much harder to find those problems because you dont know what you are looking for. Besides, if you dont like the problem on the picture you dont have to spend all the time on finding it! There are relatively many pictures of unknown areas and areas without circuits in my book because problems are more difficult to find there. With the pictures I also try to motivate people by showing them the beauty of the problems. Together with the star system they represent the best problems of an area. I also tried to reflect all styles of climbing and all grades in my book. And of course the pictures show the friends I climb with. These climbers all helped me make this book and portraiting them is a way to thank them. I am a great fan of black and white photography and with all pictures in the same colour they are easier to combine on one page. Imagine that the photos are taken in different seasons, with different cameras at different times off the day. All originals are very different in character and are therefore aesthetically hard to combine. Because I want the pictures near their description and because I choose specific problems I cant just combine pictures that go nice together. Besides all this, full colour printing is much more expensive. - Bleaus topography is rather complex, especially for some sites like Apremont, what methods did you use to draw the various maps ? First I collect all existing information I can find. I compare the topos and problems and make a rough sketch at home. Then I choose a circuit to use for orientation. With this sketch and my compass I visit the area and I make corrections until I am satisfied. This second time I also focus on the paths and tracks and other landmarks that might be useful. There are only a few areas I have drawn without other information: Recloses, Mont Simonet, Boigneville, Roche aux Sabots (sud), Petit Montrouget and Haute Pierre. - First edition did not list traverses. In this update, you include a selection of 34. Why this change and why so few of them ? How did you make your choice ? I dont like to climb traverses. Especially there and backs and other games. 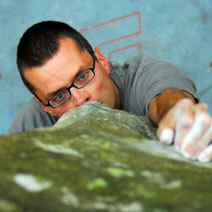 For me bouldering is like climbing: you try to reach the top the easiest way up. Thats the main reason why I dont list traverses. I also dont know enough about traverses; which have traverse gradings an which dont? Where do they exactly start and do they top out? Are they without top holds? Most topos are not clear about this at all. The only traverses I do like are the obvious ones with an obvious start, an attractive line and a logical top out. Some climbers where disappointed about my decision to leave out all traverses in my first book. I had some space in my second book and I decided to list the hardest, classic and most logical traverses in the areas I already describe. Most of them are problems I saw during my searches for straight ups and remembered afterwards because of their beauty. Also the star system on bleau.info was a great help. When I ran into Thierry Guéguen by chance I showed him my list and he suggested some changes. But I have to agree my traverse list is a list by somebody who doesnt know much about traverses. - 1789 a choice or an accident ? - A word of conclusion ? I would like to thank all my friends who helped me with the realisation of the second edition of my guidebook. They invested precious climbing time! I am also very thankful for all positive reactions I received. I also want to thank everybody who made this project possible without knowing it. These include the authors of all the other guidebooks and all websites with information on Fontainebleau. And, who knows, with their positive attitude they might even encourage me to think about a third edition! This will not be before 2012 and I will be 43 then. Although there are many strong Bleausards older than that, I dont know if I will be as fit as they are at that age.